When Jericho Forge married India Baptiste, he made it very clear that he had an ulterior motive for wanting to marry her. And just as they have started to settle into married life, the truth of their marriage starts to slowly reveal itself. Luck of the Devil achieved a completely new level in the hot AF relationship between Jericho and India Forge. Things in the Forge marriage have done anything but settled down, and the only thing that the new couple can count on is their insatiable need to get as dirty as possible with each other. Jericho had his reasons for marrying India, and they still are as important as he first believed them to be. But, after his time getting to know his wife, in and out of bed, Jericho starts to realize that his initial reasons for their marriage fall far behind the need he has found to have his wife by his side. Holy freaking cliffy!! 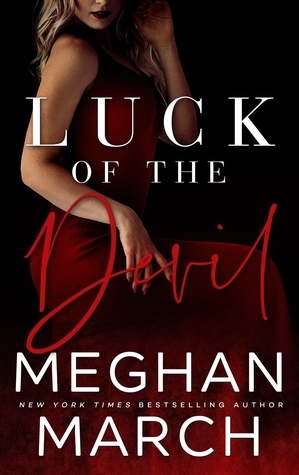 I have no idea how Meghan March can give us cliffhanger after cliffhanger that keeps getting so much more intense, and ends up being even better than the last! I absolutely can. not. wait. to read the conclusion of this trilogy, Heart of the Devil. If this book was any indication, it is going to be freaking explosive.